Basil & Mint Vietnamese Cafe, opened its doors on November 10, 2012 in Camarillo. I've been there twice already and instantly became a fan. For about $10, I leave with a mouthwatering taste of savory, filling beef rice noodles, or phỏ (which is apparently pronounced "fuh" after some heated debate...hey, I'm not Vietnamese). Old timers may notice some remnants of The Crab House at this newly renovated restaurant; namely, the wood walls and bar. But Basil & Mint is dramatically lighter and brighter than its predecessors, with lime green touches, new flooring and a clean, open and airy feel to it. On my first visit I enjoyed the Hủ Tiếu Dặc Biêt Của Basil and Mint House Special Noodle Soup, a traditional noodle soup from South Vietnam with ground chicken, roasted pork and shrimp served with rice or egg noodles and garnished with onions, scallions and cilantro. They provide a plate of basil and mint (literally) along with other flavorings for the soup. It was served quickly, piping hot and delicious. In addition to the noodle soup dishes, Basil & Mint offers rice dishes, bun dishes, noodle dishes, vegetarian specialties (quite a lot of them) and more. There are inexpensive kids meals including a chicken bowl, beef bowl, fried shrimp and wonton soup, each in the $4 to $4.25 range. The price is right. My friend ordered a grilled chicken and rice dish (Gà Nướng or better known as #27 on the menu) and before I had a chance to ask him about his food, it was down his hatch. I'm quite sure he enjoyed it. We also tried the spring rolls appetizer; very fresh and delish. Another time I came along and dined at the bar, watching sports in the background. Once again, I was pleasantly surprised not only by my tasty, satisfying, piping hot food, but the prompt, attentive service. And I got a chance to meet the owner, who is back in "the game" after a hiatus. He's got a winner on his hands in my opinion. 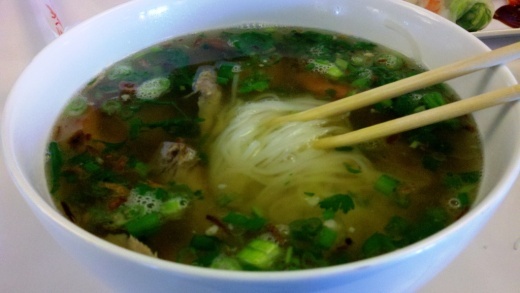 Phở Bò / Beef Rice Noodle Soup (Fragrant beef broth with scallion, onions, and cilantro. Served with rice noodles and your choice of beef (meatballs, round eye steak, both of which were my choices, beef tendon, beef flank, beef tripe, well done brisket and beef brisket). I love this stuff!Basil & Mint Vietnamese Cafe is open starting at 11 a.m., 7 days a week. Located at 350 N. Lantana St, Suite 7, Camarillo, at the corner of Daily and Lantana (in close proximity to Cronies, Wood Ranch BBQ, Bobbi's Mexican Food, Sheila's Place Wine Bar and Peking Inn). Visit www.phobasilmint.com or call 805.482.9993.